Get your FREE phone today! Thank you for visiting our site. 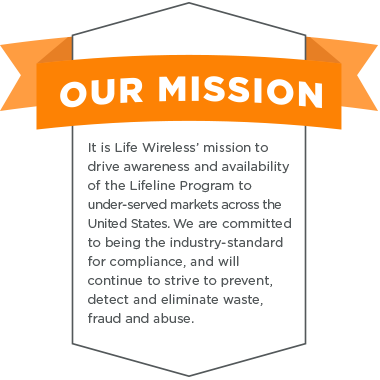 To learn more about Life Wireless, please download our company fact sheet (or California LifeLine fact sheet) and continue browsing the resources on this page. Life Wireless makes a tremendous impact in local communities. Below are testimonials from some of our outreach partners. "In our area there is a lot of unemployment and a variety of people with diverse ethnicities that rely on public assistance. With all of their bills that they are consistently struggling to pay, having to spend money on a cell phone is really, just too much. Life Wireless has really been a blessing because they have enabled these people to reach out and connect, building relationships with family and friends. An aspect we really appreciate about Life Wireless' business is that they are so relational, and that is what we, as a Lutheran organization, are all about: building relationships. We especially like that they show up in person and business is done face-to-face. Representatives are responsible, welcoming and always treat every customer with incredible respect. Working with Life Wireless has been very enjoyable." "Over half of the people here don't have a phone at all...The company that's giving them a way is called Life Wireless...We feel like it is a lifeline. It is a lifeline to people that need the help." To obtain Life Wireless service potential subscribers must meet certain eligibility requirements such as receiving governmental assistance or a household income that is 135% or below Federal Poverty guidelines for a household of that size, or the percentage guideline for your state. The specifics of what determines a potential subscriber's eligibility are specific to each state. Life Wireless service is limited to one per household, and cannot be combined with any other Lifeline offering.